Audi’s Q5 is a premium B-segment crossover, occupying a sizable chunk of real estate in the epicenter of the automotive market. 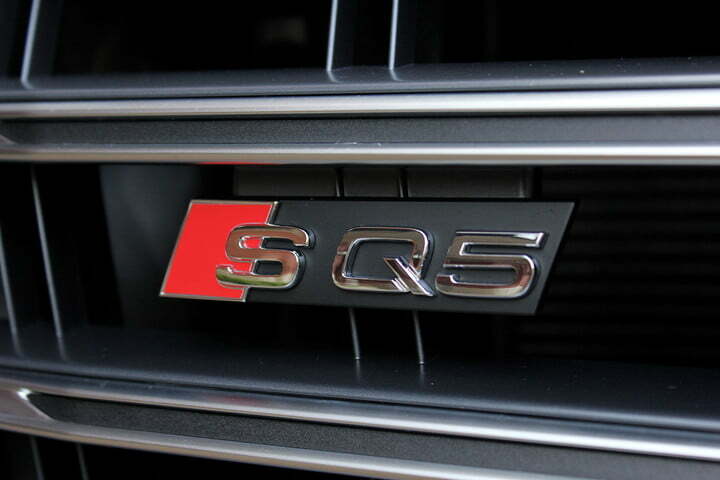 To broaden its SUV’s appeal, Audi introduced a high-powered version in 2013: the SQ5. Sharper styling and improved performance brought younger, predominately male consumers into the fold. With the Q5 now in its second generation, Audi has overhauled the S-badged derivative to better compete with a tenacious competitor set. As strong proponents of the previous generation SQ5’s design, we weren’t itching for a styling overhaul. 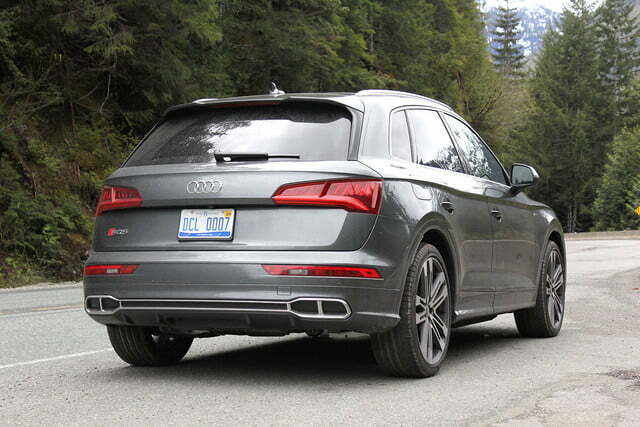 Thankfully, the 2018 SQ5’s design is more of a progression than a rip-and-replace of the predecessor’s cues. The biggest changes to the SQ5’s exterior include a more defined character line, increased roofline rake, redesigned LED headlights and taillights, and a new Single-frame grille. 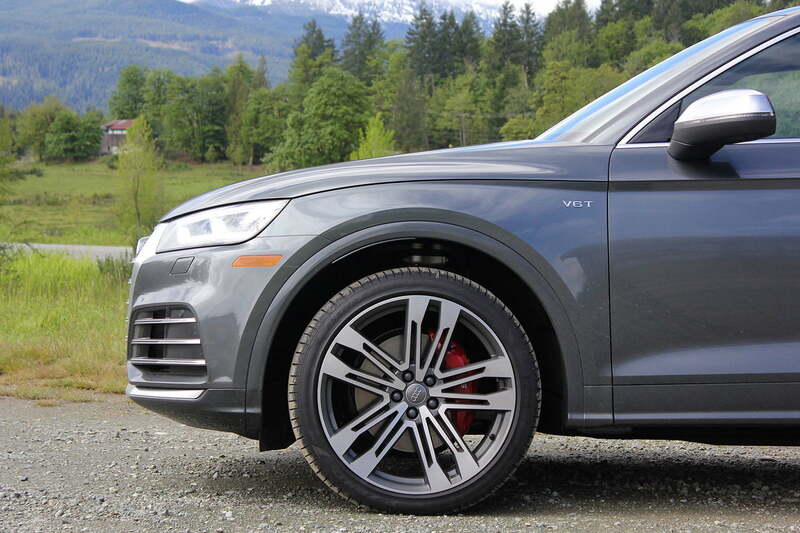 Our favorite look is from the side, where the SQ5’s profile reminds us, favorably, of the Porsche Macan. While the new front fascia complements the angular bodywork, there may be one too many horizontal slats for us to call it handsome. 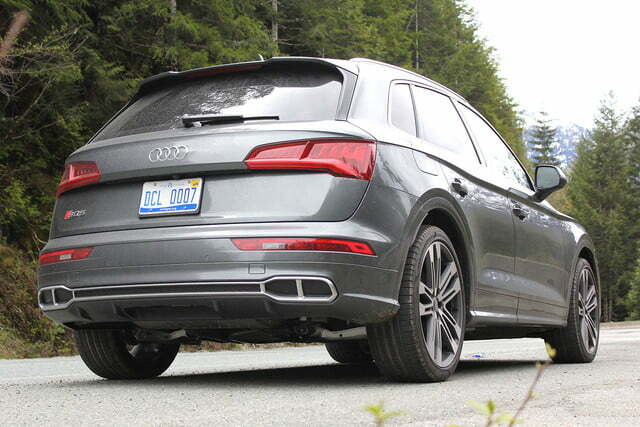 Our one real criticism of the updated SQ5’s exterior aesthetic is Audi’s decision to abandon four distinct exhaust ports in favor of a stylized lower bumper. Audi says the move to integrate its pipes within a single piece of bodywork is for the sake of aerodynamic efficiency, but we doubt the gains are worth losing such a signature design trait. The rear end is partially redeemed by a restyled clamshell trunk lid and integrated spoiler. 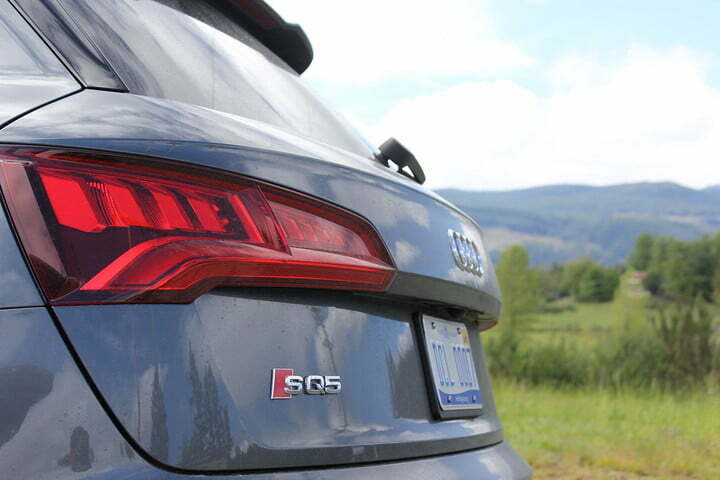 Thankfully, the 2018 SQ5’s design is more of a progression than a rip-and-replace of the predecessor’s cues. 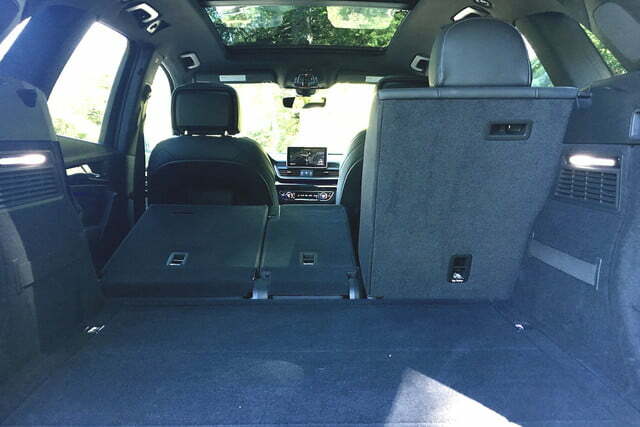 If you can part with another $4,200, the Prestige package adds dual-pane acoustic glass for the front side windows, a color head-up display (HUD), premium sound system, navigation, digital driver display, and a surround view camera system. Standalone options include 21-inch wheels wrapped in Pirelli summer or all-season tires, carbon fiber interior accents, Nappa leather seating surfaces, and a $3,000 Sport package that includes red brake calipers, adaptive air suspension, and a sport rear differential. Like the Q5, the new SQ5 benefits from Audi’s latest convenience features, putting it at the cutting edge of its segment. Genuine technophiles won’t be able to resist the bundle of digitized goodness that is the Prestige kit. A standard 7.0-inch MMI infotainment system control is vivid and intuitive, with controls for media, radio, navigation, interior lighting, and drive modes. Steering wheel-mounted controls, voice recognition, and physical buttons add redundancies for safer operation. Two standard USB ports let you sync your iPhone or Android smartphone with MMI while charging the device. The SQ5’s standard goodies are commendable, but genuine technophiles won’t be able to resist the bundle of digitized goodness that is the Prestige kit. Audi’s Virtual Cockpit alone is worth the price premium. 12.3-inches of crystal clear visuals can be configured to prioritize navigation, media, telemetry, or speedo/tachometer information. The SQ5 also features a sport display to put the tachometer front-and-center. Other clever features include a color HUD that can be adjusted or switched off completely, a crisp, powerful Bang & Olufsen sound system, and a birds-eye view camera system that will help you squeeze in and out of even the most challenging parking spots. We’re a bit at odds with the SQ5’s cabin. We know Audi builds a quality cockpit – its entire product portfolio is a testament to the automaker’s interior design prowess. That said, the SQ5 feels trapped somewhere between good and great. Remove the technology from the equation and there isn’t much to write home about. 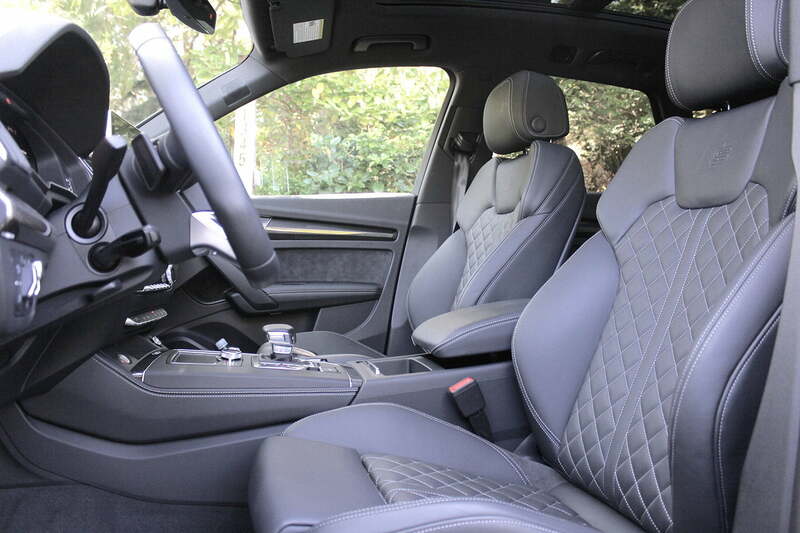 Standout features include a set of comfortable, form-fitting sport seats trimmed in leather and Alcantara, a phenomenal three-spoke, flat-bottom steering wheel, Alcantara door panel inserts, and brushed metal surrounds for the gear selector, touchpad, climate controls, air vents, and steering wheel spoke. The new Q5’s longer wheelbase also translates to more rear legroom and 60.2 cubic feet of cargo space with the rear seats folded. The cabin’ weak link is its dashboard layout. 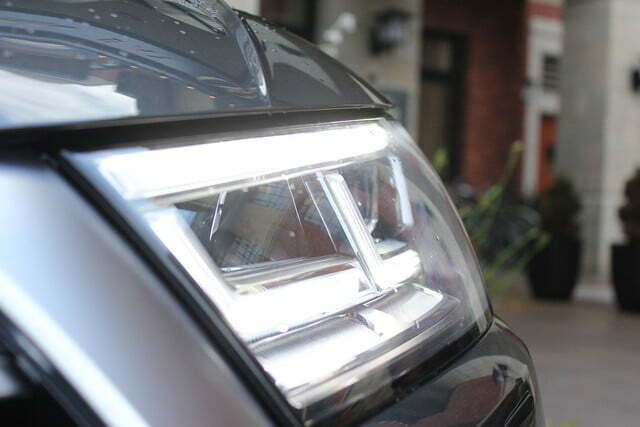 While even the A4 has embraced the Q7’s single-piece horizontal dash (providing a sense of width via connected air vents), the Q5 sticks to a driver-oriented configuration. Though not unappealing, the segmented dashboard (including some cheaper plastics slotted between the center air vents and the upper dash panel) makes the front compartment feel tight. Audi’s 2018 Q5/SQ5 still sits at the higher end of its segment when it comes to cabin styling, but we expect a knockout at this point. The biggest changes to the 2018 SQ5 are experienced once in motion. 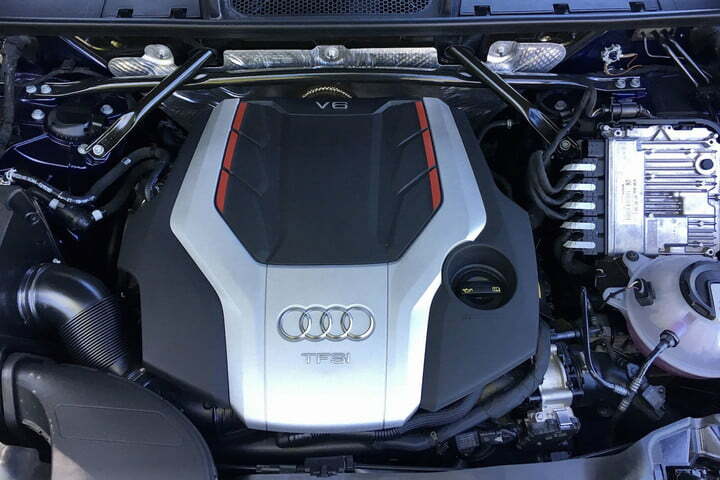 Under a re-sculpted hood sits a new 3.0-liter V6 with a single turbo mounted between cylinder banks. Lighter and more efficient than the engine it replaces, the new powertrain also bumps output by 32 horsepower and 15 pound-feet of torque for a total of 354hp and 369 lb-ft of torque. An eight-speed automatic transmission replaces Audi’s S-tronic dual-clutch for greater efficiency and smoother gear changes. The 2018 SQ5 earns 19 mpg city, 24 highway, and 21 combined – a bump of 2 mpg combined. Our greatest compliment to the SQ5 is that it feels just as precise and agile as the new S4 – a sport sedan triumph. Bolstered by a re-tuned Quattro all-wheel drive system, the new SQ5 blasts to 60 mph in 5.1 seconds (0.8 seconds quicker than the 2.0T Q5). While not neck-snapping quick, the SQ5 will cruise along at triple-digit speeds without the slightest hesitation (not that we have personal experience or anything). 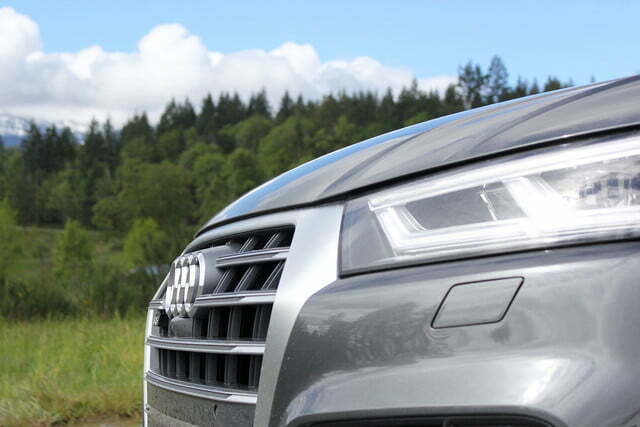 Fast as it is in a straight line, the SQ5 truly shines on a twisty road. Audi’s optional Sport package includes two important pieces of hardware: an active rear differential that can shunt up to 100 percent of available torque to each wheel, and an adaptive air suspension. The standard suspension will adjust damper stiffness based on drive mode, but ride height is fixed. 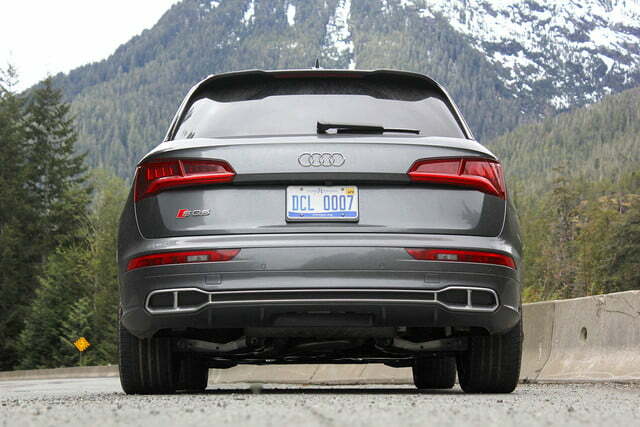 The optional air suspension can lower the SQ5 by up to 30mm or raise it up 50mm. Oh, and before you mock the SQ5 as an off-roader, be sure to check out the fully lifted rig – there’s more than enough ground clearance for light to medium trails. Though we typically favor purity in a driving experience, Audi’s variable ratio steering system complements the electronic rack perfectly. In short, the system adjusts necessary steering input based on vehicle speed. At a faster clip, the system will automatically shorten the ratios so smaller inputs will have a greater impact on the front wheels. 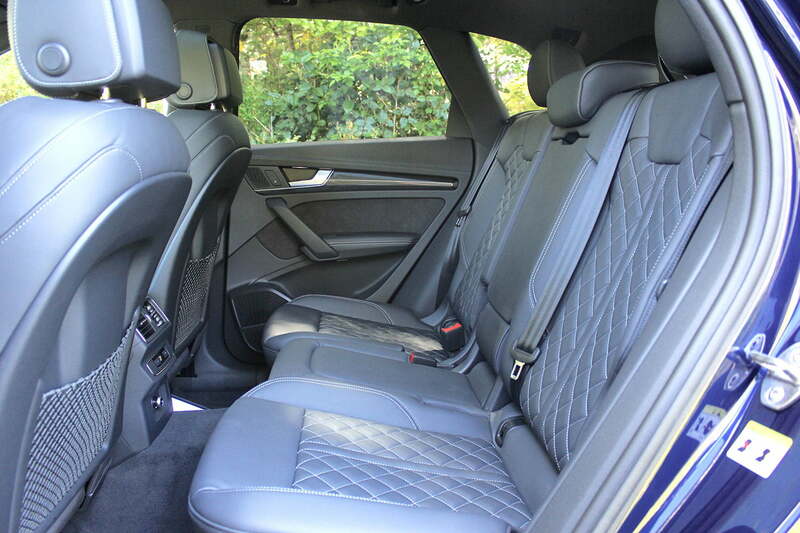 As a result, the SQ5 feels vastly more responsive when cornering. 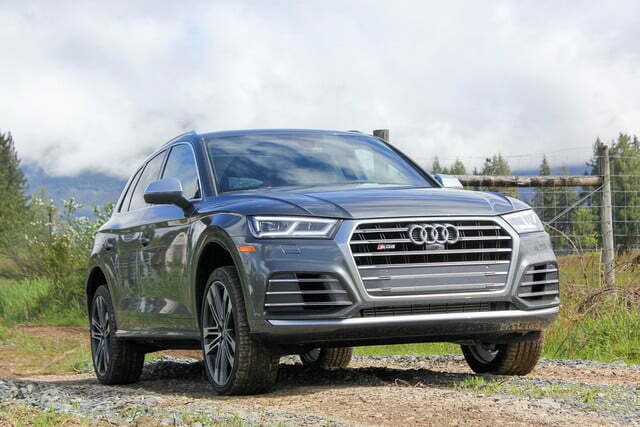 The National Highway Traffic Safety Administration (NHTSA) and Insurance Institute for Highway Safety (IIHS) have yet to rate the 2018 Audi SQ5, but the previous generation earned IIHS Top Safety Pick + honors and a 4-star rating (out of 5) from the NHTSA. The 2018 SQ5’s standard safety features include 6 airbags, LED daytime running lights, automatic emergency braking, low-speed collision assistance, electronic stability control, blind spot monitoring, rear cross-traffic alert, a rearview camera, and LATCH child safety system. Optional extras include adaptive cruise control, lane keeping assist, a HUD, and surround view camera. 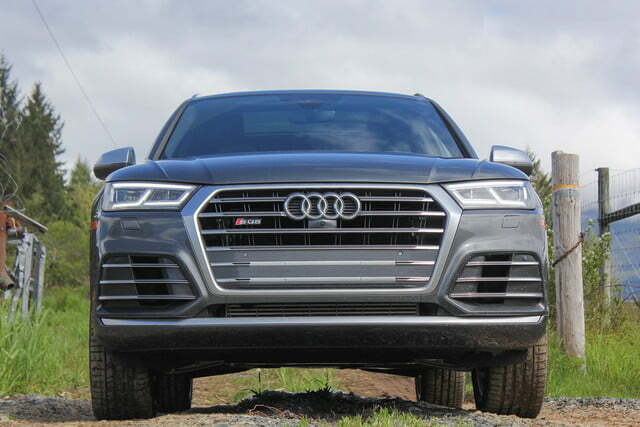 The 2018 Audi SQ5 squares off against some tough competition. The Mercedes-AMG GLC43 and Jaguar F-Pace both make more power, and BMW’s X3 xDrive35i is significantly cheaper. 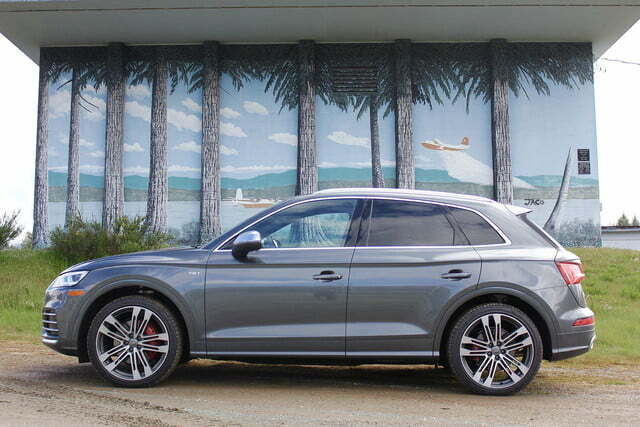 Despite these on-paper disadvantages, the SQ5 is a compelling sport crossover. Its robust list of standard features, crisp handling, and innovative technologies will help Audi capitalize on a burgeoning segment for years to come.